Allows to use your favorite Ultra SCSI device as the latest USB2.0 device! 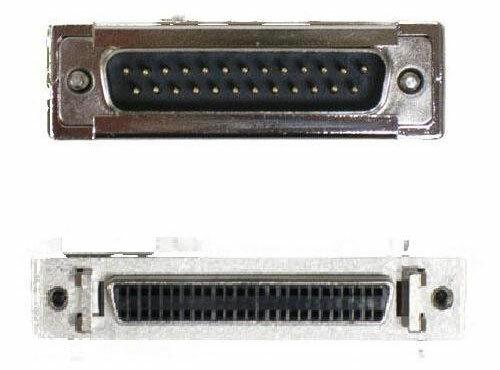 Allows to attach directly to SCSI 50P High-Density port. Driver and Utility for Windows Vista/7 are now included in current package. If the package doesn't include Vista software CD-ROM, refer to Software Download Page. 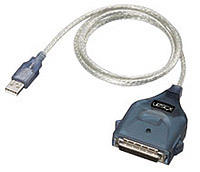 Connect U2SCX to your SCSI device, and plug its USB cable to the USB port. Available to use in just a second. Allows Hot-Swappable as an USB device. No need to restart the OS, open the case, install SCSI board, or change SCSI ID setting. Fully compatible with both USB2.0-enabled port and USB1.1-enabled port. Automatically detected and mounted as an USB1.1 Full Speed device with USB1.1-enabled port. U2SCX get it's own power through the Term Power pin from the SCSI device. Supports High-speed USB2.0. Date transfer rate up to 480 Mbps. Scanners, Film Scanners, CD-ROM, CD-R/W, DVD, Zip, Jaz, HDD, MO,VueScan, WinBench and more. Refer to "Certified SCSI Devices" below. The U2SCX has two different operation mode and switches automatically. With Microsoft standard Mass Storage class driver. Supports only one SCSI device per one U2SCX. With RATOC original driver. Supports up to seven SCSI devices in daisy per one U2SCX. You must use this mode for image scanners, film scanners or other SCSI devices except mass storage devices. *SCSI emulation mode is only for Windows. 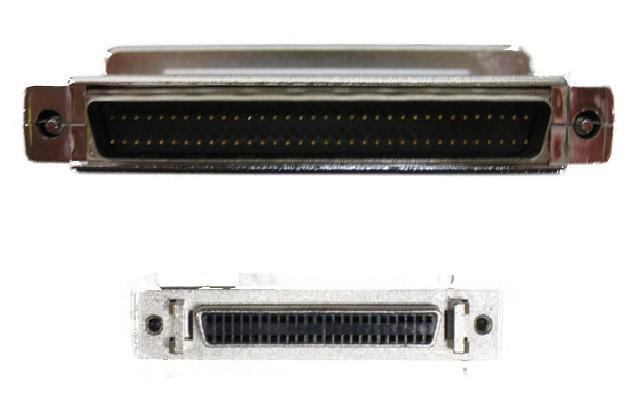 Ultra-slim and compact design allows you to use with another SCSI connector either side-by-side or stacked. *Regarding Windows Vista software, refer to Software Download Page. *Note :USB 2.0 embedded controller or add in host adapter required for USB2.0 speed, otherwise it works as USB1.1 device. Refer to the compatible device list for more detail. USB TypeA Plug with 1 meter (39') USB 2.0 certified cable. If the package doesn't include Vista software CD-ROM, refer to Software Download Page. Operating requirements - DC +5V 300mA (Max). 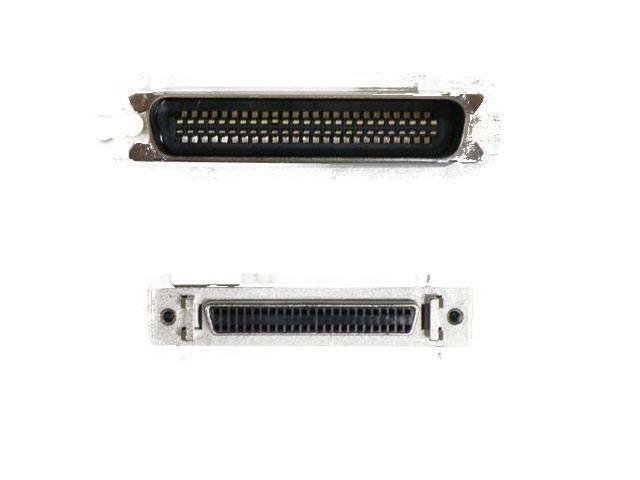 SCSI device must provide the power through SCSI Termination Power output pin. If SCSI termination power is not available, you need to connect an OPTIONAL AC adapter (sold separately). For CBU2, if USB devices need more than 300 mA from USB cable, this adapter is needed. Both FR1SX and U2SCX work with term power from the SCSI device. If the SCSI device doesn't supply term power to SCSI bus, you need this optional AC adapter. Microsoft Windows(R) is a registered trademark of Microsoft Corporation in the U.S. and other countries. Macintosh(R) is a registered trademark, and Power Macintosh, Mac OS 9, Mac OS X, FireWire are trademarks of Apple Computer. All other products, services, names and registered trademarks are trademarks of respective companies.